Welcome to the webpage for the British Ridden Heavy Horse Society for ridden purebred heavy horses registered in the respective studbooks of the British Shire, Suffolk, Clydesdale and Percheron Societies incorporating a section for first cross heavy horses by a registered sire or dam in the Shire, Suffolk, Clydesdale and Percheron Societies studbook. 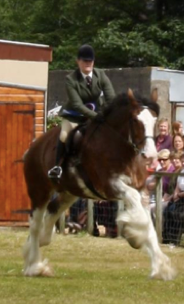 The Ridden Heavy Horse Society will both champion our indigenous heavy horse breeds as a ridden show horse, some of which are now endangered and others on the rare breeds list, whilst trying to encourage more shows to put on ridden heavy horse show classes with proper ride judges who understand the unique character of the heavy horse breeds under saddle. Showing guidelines have been drawn up with help from a group of established panel ride judges and heavy horse breed judges. The BRHH Society will operate similar to other recognised ridden societies, with suggested guidelines on horse and rider turnout, judging rules and guidelines for both competitors and judges. It is hoped to standardise judging rules at all levels of shows and to encourage higher standards of presentation and schooling of ridden heavy horses whilst ensuring breed type / standard is maintained. Membership will be free to competitors and the Society are offering 30 qualifiers for the Kilmannan Ridden Heavy Horse Championship to shows around the country who hold ridden heavy horse classes. The highest placed pure bred Shire, Suffolk, Clydesdale and Percheron within an affiliated pure bred heavy horse ridden class will qualify for the ridden championship final at Equifest. Those qualifying will receive a qualifying rosette and prize card. Qualifiers will not go below third place. It is hoped that each breed society will wish to offer a qualifier and be represented at the final. 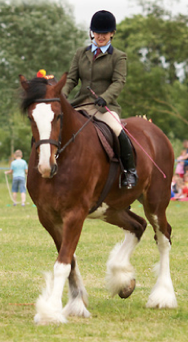 The Kilmannan Ridden British Heavy Horse Championship final will be held at Equifest in August. There will be both a ride judge and conformation judge and the class will be judged using the points system. Points awarded out of 50 for: Manners, Way of Going with Breed Type / Judges Ride. Points out of 50 awarded for: Conformation, Type, Freedom of Action. Finalist rosettes will go down to tenth place with a challenge trophy and champion and reserve sashes. Along with the Kilmannan Ridden Championship, Equifest will hold two ridden heavy horse show classes on the Saturday before the championship; one for purebreds and one for first cross part bred (criteria as above) with the winners qualifying for the championships. The Society in it’s infancy, will inevitably face many challenges and critics over the next few months. It is not designed to be all things to all men and will take time to become fully operational and won’t happen overnight. The guidelines will be reviewed at the end of the year and amended if necessary. It is hoped that in due course to establish a list of approved ride judges for shows to call on and for the Society to hold periodic study / training days for both riders and judges. Starting in 2014 the Society will also offer an annual points awards scheme for the best British Ridden purebred show Shire, Suffolk, Clydesdale and Percheron. 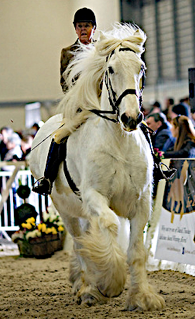 In addition a British Ridden Heavy Horse Enthusiasts Award the latter aimed at those who regularly champion the ridden heavy horse breeds at events but do not necessarily take part in show classes. Champion and Reserve sashes and rosettes will be awarded in each section to the two highest points winners. Do you want to be part of the "World’s Most Famous Horse Show" Amazing Sponsorship opportunities for the British Ridden Heavy Horse Championship at the Horse of the Year Show 2016. Fantastic way to promote your companies' products or services in front of an engaged audience of over 60,000 visitors. Packages to include hospitality experiences and various advertising opportunities which can be tailored to suit your requirements. To receive further details and build a tailored package please contact Wendy Toomer-Harlow (wendyt-harlow@tiscali.co.uk) or Sally Unwin at Grandstand Media (Sally.Unwin@grandstand.co.uk).